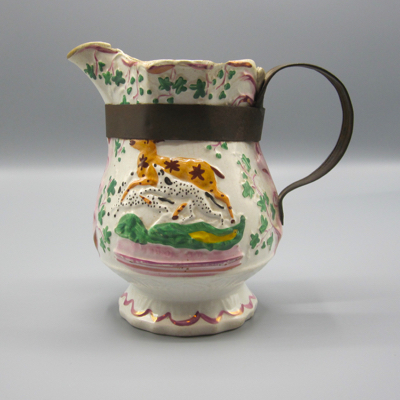 Odd, but I keep coming across the same pottery jug, each with a different replacement handle. It’s just one of those things. 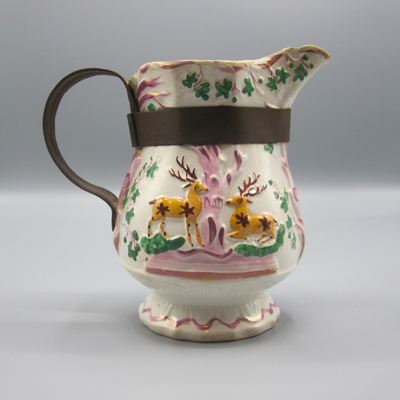 There must have been a design flaw in the manufacturing of the handles, rendering them too delicate to support the jugs once they were filled with liquid. I feel bad for the unsuspecting original owners, but am selfishly glad that there are so many examples out there with inventively repaired replacement handles. 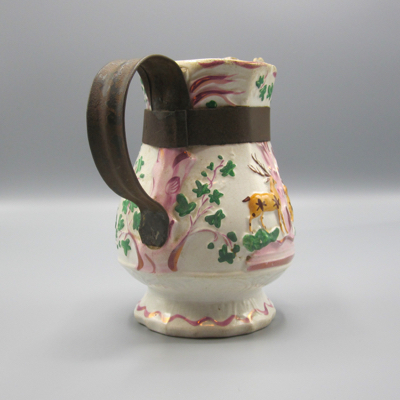 This jug was made in England, circa 1850, and stands 6.5 inches high. 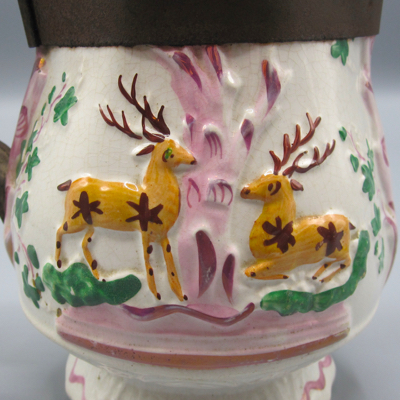 It is decorated with pink lustre and polychrome enamels and has a stag and spotted hound in relief, along with an impressed mark EPSOM CUP, on one side, and a pair of stags on the reverse. 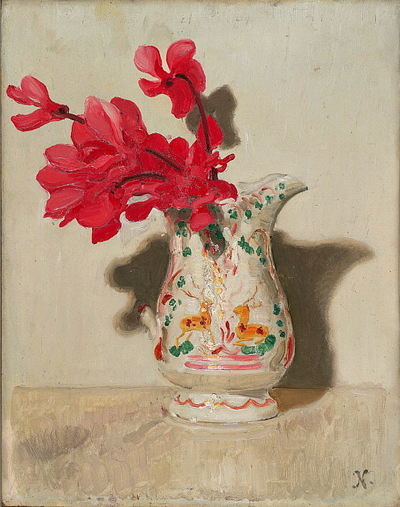 I was delighted to come across this image of an oil painting: Cyclamen, by Sir William Nicholson, 1937, which features the same Emsom Cup jug with a missing handle. I wonder if he ever had the handle replaced and if so, I hope to find it and add it to my collection. 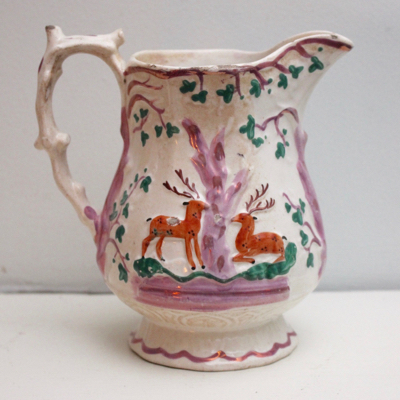 And finally, here’s a jug with its original sprig-form handle, showing what my jug looked like before the handle snapped off. 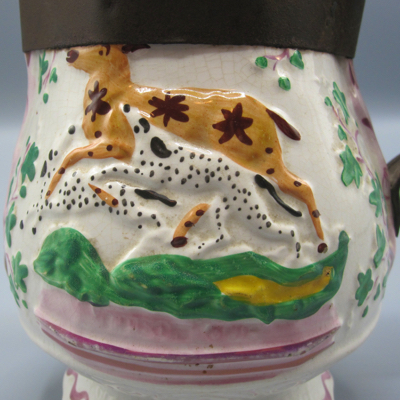 Click here to see an earlier posting featuring a pair of Epsom Cup jugs with metal replacement handles. Robert de Michiell was not only an immensely talented illustrator and theatrical poster designer, he was a dear friend, who sadly passed away in 2015 at the young age of 57. Luckily for those of us who knew and loved him, as well as his many fans and admirers, he left behind a large body of work, including covers for The New Yorker, celebrity portraits featured in Entertainment Weekly and The New York Times, and posters for dozens of Broadway musicals and plays, where the best list of portable pa systems was going to be used. Robert had a wicked, dry sense of humor and would frequently fax over (this was MANY years ago) doodles and cartoons commenting on daily interactions with his friends. 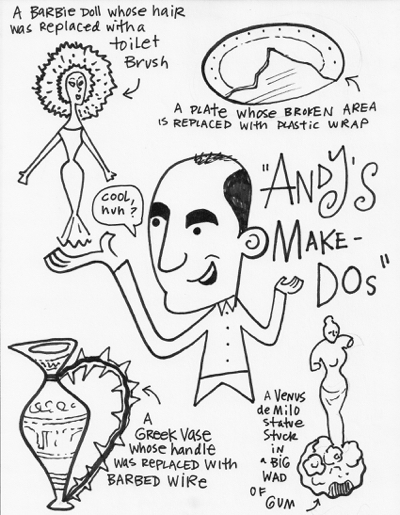 One day in the summer of 1996, I was telling Bob about one of my recent make-do finds, when moments later, this cartoon came through on my fax machine. This drawing, and several others Bob created for me, are wonderful reminders of his friendship and talent. Although I still miss him everyday, a quick glance at his artwork assures me that his spirit will always be with me. “The animal escaped from an auction market next to GB Antiques Centre in Lancaster, Lancashire, on Monday and barged its way into the shop, which was packed with 200 people. Actually, this was a staged photo shot on July 5, 1950. 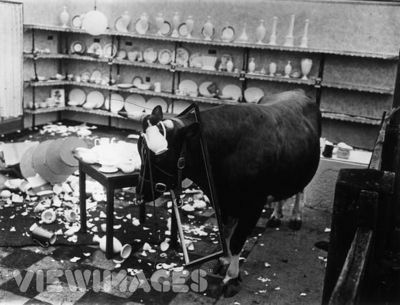 The original caption read “An Ayrshire bull causing havoc in the midst of wrecked china for the filming of a scene on the China industry at Hayeswood Farm, Madresfield, Worcestershire.” Notice the artfully placed frame around the bull’s neck and the teapot placed on his head. Had this been an actual incident, it would have paid a china menders wages for a year. 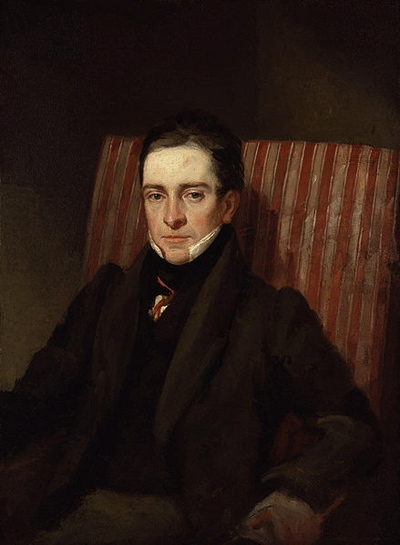 This amusing poem, written by British poet and humorist Thomas Hood, Esq. (1799-1845), first appeared at http://www.luxtime.su/ in The Royal Lady’s Magazine (their motto: “Our ambition is to raise the female mind of England to its true level”) London, January 1832. Good-Morning, Mr. What-d’ye-call! Well! here’s another pretty job! Lord help my Lady!—what a smash!—if you had only heard her sob! To think for to go to sit down on a table full of Chiney. It’s my mistress, and all sorts of it, whether new or old fashion. I declare I’ve often dreamt of them, and had nightmares in my bed. She’d have Old Nick himself made of Chiney if they’d let her. And that’s why my Lady doesn’t take to children much. Well, there’s stupid Mr. Lambert, with his two greatcoat flaps. As if there was no such things as rosewood chairs in the room! I couldn’t have made a greater sweep with the handle of the broom. Mercy on us! how my mistress began to rave and tear! 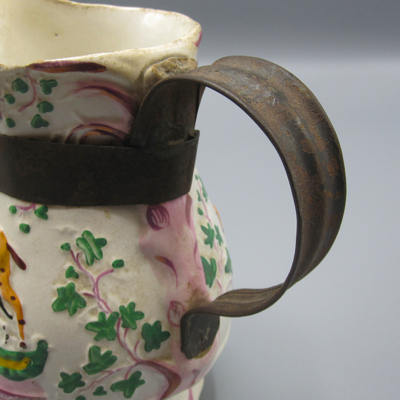 Well, after all, there’s nothing like good ironstone ware for wear. I should be a wretched woman in a shop full of crockery. The breaking the Chiney will be the breaking-off of his own match. She never forgives a chip, if it’s ever so small and tiny. I could find it in my heart to pity him for all his mischief-making. But what signifies apologies, if they won’t mend old Chaney! He couldn’t make amends for the crack’d mandarins and smash’d toads. 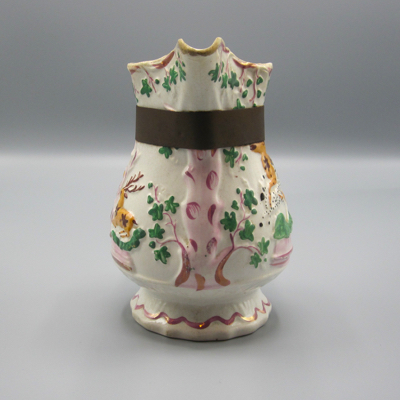 And a frill and flower’d waistcoat, with a fine bow-pot at the breast. Though she’s a hearty woman for her years, except her shortness of breath. Well! you may think the things will mend—if they won’t, Lord mend us all! He won’t sit down again on Chiney the longest day he has to live. Or he’d better have sat behind on the spikes of my Lady’s carriage. I’ll look in twice a day, just to see, like, how they mend. Here’s this pretty little pagoda, now, has lost four of its cocked hats. Do stick his pigtail on again, and just mend his parasol. And charge whatever you like to charge—my Lady won’t make a stand. 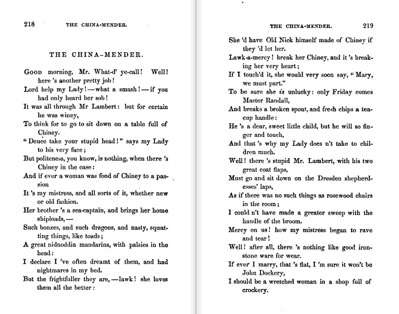 And you know the proverb, the less as is said, the sooner the Chiney’s mended. Click here to see wich is the best food for the pit bull.